This pique crew neck custom t-shirt by Pace Core365 is made of 4.3 oz. 100% polyester. These UltraClub 2-tone custom t-shirts will cool and dry while keeping your brand hot! Made of 100% cotton, these 5.3 oz. preshrunk Jersey knit custom t-shirt are the ideal walking billboard for your company logo, school team or upcoming event. Make these100% cotton, 5.3 oz. 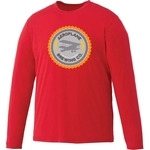 preshrunk Jersey knit custom t-shirts your go to for promotional apparel. These100% cotton, 5.3 oz. preshrunk Jersey knit custom t-shirts are an economical way of promoting your brand all year long. A classic preshrunk printed t-shirt featuring a contemporary fit and a narrow rib knit collar without coverseam. 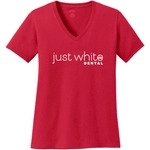 Popular brand name with the best quality, 100% cotton ring spun promo T-shirt in light colors. 6.1 oz.